Leonard Nimoy's passing reminds us of the spirit of wonder and discovery represented by Spock and the Star Trek series. Toward the end of Star Trek II: The Wrath of Khan , the body of Spock, encased in a coffin made from photon-torpedo casing, is launched in a formal Starfleet burial “at sea” into orbit around a newly forming planet. But Kirk here is really speaking to the audience more than to his fellow officers aboard the starship. He is echoing the words of Star Trek creator and ardent humanist Gene Roddenberry that Spock was “the conscience of Star Trek.” Through Kirk’s funeral speech, the writers are reminding us that the beloved hyper-rationalist, ultra-logical half-human, half Vulcan character is the heart of the series and the thematic essence of what Roddenberry had wanted to say about humanity through his work. Spock was no Vulcan at all. The story of Spock, the highly logical Vulcan society, and the universalist, optimistic rationalism that is explored through the broader series and its successors, is in fact the striving, future-oriented story of humanity and our unbounded capacity to improve our condition once we leave behind an infancy of unreason. 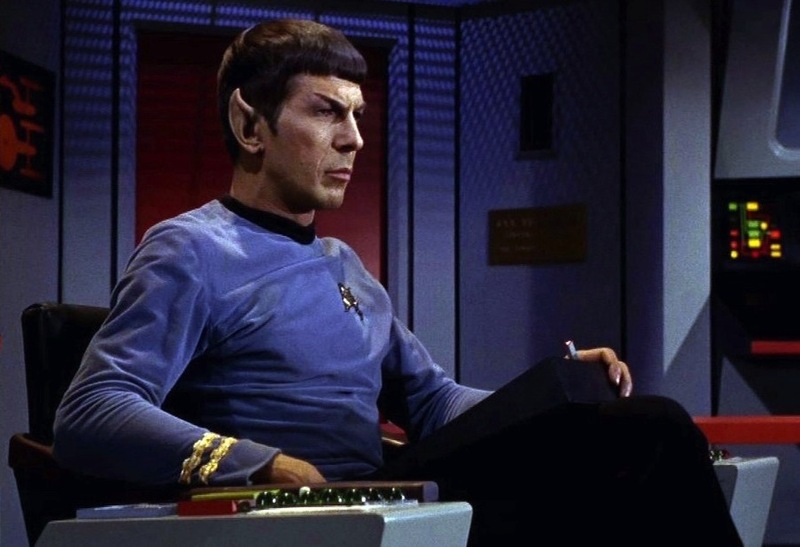 Star Trek creators expressly intended the story of Spock and Vulcan society, a civilization that emerges from nuclear holocaust to pacifist philosophical maturity, as a parallel to the progression of human society toward enlightenment. But Spock’s tale is no Pollyanna-ish narrative merely celebrating the retreat from obscurantist habits of mind that blindly accept facts about the world as deriving from authority and toward an inevitable understanding of the world based on logic and evidence alone. Spock and his Star Trek colleagues personified that postwar, Space Age, and “public sector” mood of adventure, curiosity, and ambition — a human drive, a spirit of Enterprise , you might say, but for its own sake rather than for profit, that seems to have been lost somewhere in the 1980s. In the series, Vulcans endeavor to live by reason and logic alone, and to suppress — or, more correctly, to master — emotion. But their society was not always this way. Once a war-mongering and emotional civilization, Vulcans underwent a “Time of Awakening” — the writers intended it as a loose parallel to our own Age of Enlightenment — in which the ethic of philosopher Surak, a sort of Spinoza or Maimonides figure, steadily spread across the planet. Notably in the series, Baruch Spinoza appears with some frequency. Kirk, for example, is an enthusiast of the Dutch philosopher, while Roddenberry’s wife, Majel Barrett, once said that Medieval Iberian-Jewish philosopher and astronomer Maimonides, who emphasized complete logical perfection, inspired aspects of the Vulcan philosophy. Surak held that violent, irrational, intuition- and instinct-driven emotions were the source of Vulcan’s brutal cycle of wars. In order to avoid extinction, he argued that emotion had to be bridled by reason. The core of their logical civilization was the search for truth through logical, empirical methods, and an abjuring of credulity and emotion as illogical and a stumbling block to arriving at truth. Spinoza in our own world drew on the ancient Stoics and Jewish rationalists of the Middle Ages to argue for a philosophy grounded on the “mastery of the passions” — the same phrasing used in Diane Duane’s novel, Spock’s World , as the translation of the Vulcan word for their process of restraining emotion, Arie’mnu. Spinoza was the anchor of what historian Jonathan Israel calls the revolutionary or “Radical” Enlightenment — distinct from the “Moderate” Enlightenment of such figures as Voltaire, Hume, and Newton who were keen to restrict the scope of reason and to limit its employment to gentlemen such as themselves while traditional authority remained the primary guide for everyone else. Where the figures of the Moderate Enlightenment made their peace with monarchy, slavery, or the church — Spinoza pushed on through toward democracy, equality, and liberty. Israel describes Spinoza’s principle contribution in the history of ideas as a “Revolution of the Mind,” concentrating precursors of atheist and materialist thought from ancient and oriental realms together with the emerging rationalism and empiricism of his Enlightenment contemporaries into a system of thought that laid the basis for the democratic revolutions of the eighteenth century. Spinoza’s materialist argument that “the order and connection of ideas is the same as the order and connection of things” may have anticipated the physicalism (the argument that there exists nothing beyond the physical) of contemporary scientists and the historical materialism of Marx, but it stretches back to the reaching for the material, the rational, the empirical of abundant figures in the golden age of Islamic science and mathematics while European learning stagnated under a dark age slumber, or to the engineering wonders of Tang dynasty China, or to the early materialism of Democritus and Epicurus or atomism of Jain and Buddhist thinkers. Given how widespread this urge appears to be, it is perhaps better to speak of enlightenment rather than “the Enlightenment,” without a definite article or capitalization. Nonetheless, the seventeenth-century revolution of the mind did mark something of a break: a decisive condensation of such thinking, and, like the inhabitants of Vulcan after Surak, we have been fundamentally different ever since, though the Enlightenment project remains uncompleted. As with radical ideas of the fictional Surak, Radical Enlightenment thought, writes Israel, “matured and seeped its way through large sections of society over a long period before the onset of the revolution in actuality.” As with our own often violent battles between the forces of progress and reaction, Surak’s efforts resulted in bitter conflict. Those who rejected his logic-emphasizing ethic of O’thia and “sought a return to savage ways” fought a devastating nuclear war before abandoning the planet. These anti-rationalist separatists would later become known as the Romulans, one of the arch-villain species of the series. Later on, a now peaceful and rational Vulcan becomes the first alien species to make contact with humans in the year 2063. They offer massive, Marshall Plan-like assistance to Earth after the devastation of World War III and assist us in making our transition to an interstellar species free of inequality and disease. Discussions abound online as to whether the Federation in the various series is intended as a socialist utopia (What about the Ferengi? Does Chateau Picard mean their is still private ownership of land? ), and while the series makes no explicit references to democratic planning or the market, the consensus is that, well, it does appear to be a post-scarcity socialist economy of some description, albeit with a highly hierarchical, even militarist tinge. These debates aside, with the passing of Nimoy, it is worthwhile — as it was at the time of the death of Neil Armstrong two and a half years ago — to take note of the slow and mysterious demise of the Space Age alongside the contemporary turn against rationality, science, and the Enlightenment. The cover story of this month’s National Geographic speaks to how widespread this anti-modernist phenomenon is, focusing as it does on the growing popular opposition to science in both its right and left varieties, from climate change deniers, creationists, and anti-fluoridation warriors to vaccine refuseniks, alternative-medicine charlatans, and those who oppose all GMO technology in the abstract, rather than just the corporate malfeasance of agribusiness. Meanwhile, the localist tendencies of some of the green-minded tend to locate our problems with industrial civilization rather than with capitalism — with the forces of production instead of the relations of production. And the postmodernism of the academy, which casts science and logic as Eurocentric, hubristic, and unable to recognize “other ways of knowing,” has long since left the building. The Romulans are in the ascendant. In his 1964 pitch for the show, Roddenberry had initially intended Spock to be half-Martian, but later changed his home world out of fear that part way through the series, if it were successful and had a long run, it was not out of the question that humanity could land on Mars and ruin the believability of the storyline. Such optimism seems fantastical today. The woefully underfunded and under-engineered private sector Mars One reality show abomination is no rejoinder to this lamentation. MIT researchers predict the contestants — were they actually to survive the six-month journey in a tin can to the red planet, and once the yet-to-be-invented technology to derive drinking water from Martian soil is invented — will die of asphyxiation, starvation, or incineration within sixty-eight days, and, as science journalist Dan Vergano recently noted, George H. W. Bush’s price tag for a manned landing on Mars topped $500 billion in 1989 dollars. This is a realistic figure: for comparison, the Apollo Program employed 400,000 people at its peak and cost $25.4 billion, or $170 billion in today’s money. That all means this is going to have to be one damn profitable Martian Idol. On my wall at home, I have a poster I printed of the “Integrated Space Plan” schematic that NASA supplier Rockwell International produced in February 1989 of “a very long range systematic perspective of America’s and the Western World’s space program.” Though not intended as a firm outline of what had been planned by the US space agency, it was nonetheless a very serious, one-hundred-plus year vision stitched together from a series of NASA studies. One expects a NASA contractor to be in the business of selling space, but they also couldn’t be so delusionally blue-skies that they might lose those precious contracts. And Rockwell expected that by 2007, we were to have established a lunar outpost; by 2015, astronauts would be manning a working Moonport; by 2020, “space drives [the] global economy” as “humanity commands unlimited material resources from the moon and asteroids” as well as “unlimited safe solar energy for Earth”; and by 2025 a Mars spaceport would be built. As awe-inspiring as Mars Curiosity Rover and Philae and Rosetta’s stunning chasing-a-speeding-bullet rendezvous with 67P/Churyumov–Gerasimenko have been, the architects of these triumphs will be the first to say that there is something sad about the gap between the vaulting scale of our ambition as a species as recently as the 1980s and where we are in 2015. But rather than merely sighing wistfully at unrealized visions of Cernan, Roddenberry, Nimoy, and others, at how the Kennedy Space Center has become more a museum dedicated to a glorious but fading past than a working space operations headquarters, we should also be worried. Our destiny lies beyond Earth not for romantic reasons — which Mr Spock would say would be illogical — or even because a robot is not as versatile a problem-solver as a human, but because the galaxy can be an unfriendly place. Right now, as far as we know, we are the only intelligent life in the universe. Put another way, without evidence to the contrary, we must assume that we represent the sole instance of the universe becoming aware of itself. The maintenance and further development of our consciousness, of the universe’s consciousness, is an awesome responsibility. And there can be a confident, socialist response to the current malaise, explaining how we can step back from this new dark age, from the dominion of the Romulans. We might for example note how the turn away from space is coincident with neoliberalism. It is no wonder that like the first person on the moon, Neil Armstrong, repeatedly stressed that the future of space exploration rested with the public sector and against commercialization. Whether manned or otherwise, space exploration is simply too expensive with too little promise of profitable return for the private sector to care about anything beyond the servicing of low-Earth-orbit satellites. Leonard Nimoy’s passing reminds us of the spirit of wonder and discovery represented by Spock and the Star Trek series.